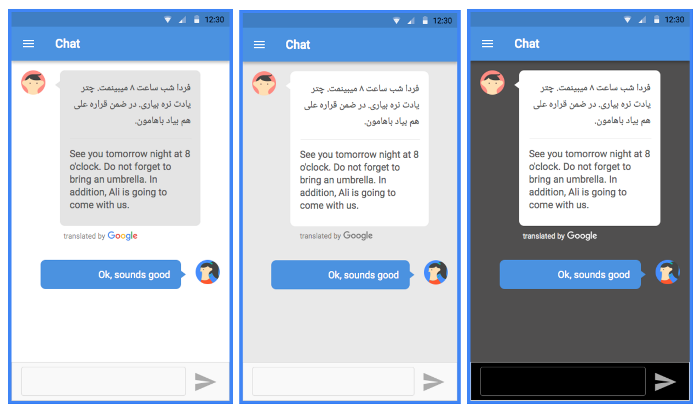 The Cloud Translation API is available to anyone wishing to integrate with Google Translate from their own site or application. Use of these APIs is governed by the Terms of Service. Among other things, these Terms require that you adhere to certain guidelines on how layout, Google attribution, and branding must be handled on your site. This document and the HTML Markup Requirements are intended to help you meet these requirements. These branding guidelines may change from time to time, and without prior notice from Google. Your continued use of the Cloud Translation API is contingent upon your adherence to the current branding guidelines. If you are uncomfortable with any of these branding guidelines, discontinue your use of the API, and contact us with your concerns. Adherence to these guidelines is required prior to use of the Cloud Translation API from your website or application. Whenever you display translation results from Google Translate directly to users, you must make it clear to users that they are viewing automatic translations from Google Translate using the appropriate text or brand elements. Applications using the Cloud Translation API must state in the application description and help documentation that Google Translate is used to power translation within the application and provide links to the Google Translate site. If unaltered translation results are displayed on web pages that can be indexed by search engines, you are required to designate the translated text as machine translated content using the HTML markup reference. To help us ensure a consistent end-user experience and accurate expectation of Google Translate features, you must abide by certain naming conventions. When creating a product utilizing the Cloud Translation API, the name of the product cannot use Google, Google Translate, or other Google Brand Features in the name of the software. If for marketing or other strategic reasons it would be valuable to have Google Translate referenced, it may be permissible for the developer to use the phrase (e.g., 'Acme Plugin for Google Translate,' but never 'Google Translate AcmeOPAC Plugin'), however this should be the exception and not the rule. You may not state or otherwise imply any affiliation with Google or Google Translate. 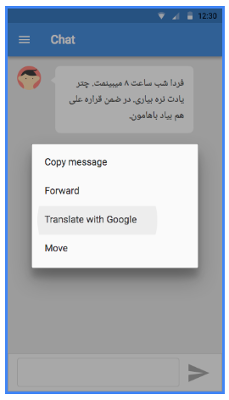 Google Translate service: Use only the term "Google Translate" to refer to the service made available through these APIs and at URLs such as http://translate.google.com. Do not modify this word mark, for example, through hyphenation, combination abbreviation, or acronym such as: Google-Translate, GT, GoogTrans, GTrans, etc. Cloud Translation API: Use only the term "Cloud Translation API" to refer to the set of developer-facing features described within the Cloud Translation API Documentation. Refer to specific APIs and tools using the terminology from this site. If you wish to refer to Cloud Translation API features in a language other than English, you must do so using the same terminology as the Google Translate Site, which is available in over 50 languages. In addition to following Google's general Brand Features guidelines, you are also required to adopt certain branding elements when using the Cloud Translation API. These forms of attribution are used in order to maintain consistency and preserve the Google brand identity. The Google name and logo should be associated with Google Translate only. The Google logo may never appear next to or on the same page with the logos of competing web or other search services. There are no exceptions to this rule. The "powered by Google Translate" graphic must always be displayed adjacent any translation results. You shall display any and all intellectual property rights legends and notices (e.g., copyright notices) as instructed by Google. Your application may display, in response to a user's action, translation results obtained from the Cloud Translation API. Whenever you display such information, you must include attribution to Google using one of the badges below. Attribution badges on web pages must link to http://translate.google.com. You can download a zip file of the badges here. Using the Cloud Translation API, it is possible to issue a call to Google Translate directly from your site. The buttons or links you use in conjunction to these features must include proper attribution to Google. Do not change any of the Google marks in any way. Do not remove, obstruct, distort, or alter any element of a Google Translate trademark. This includes modifying the Google word marks, for example, through hyphenation, combination abbreviation, or acronym such as: Google Translate, GT, GoogTrans, etc. Make sure the button, sticker, or other branding element is full and clearly visible, never altered or partially covered. Do not use the buttons, stickers, or other branding elements in ways that (1) imply an association with or endorsement of any other product, service, event, sponsorship, or organization; (2) can be reasonably interpreted to suggest editorial content was authored by Google; or (3) represent the views or opinions of Google personnel without prior written permission from Google. All of the aforementioned usages must be approved via written permission. Do not adopt marks, logos, slogans, or designs that are confusingly similar to the Google trademarks or imitate Google's trade dress, including the look and feel of Google Translate web design properties, Google Translate brand packaging, distinctive color combinations, typography, graphic designs, product icons, or imagery associated with Google Translate. Do not register Google trademarks as second-level domain names or incorporate Google trademarks into your own product name, service names, trademarks, logos, or company names. Never display a Google trademark in a manner that is misleading, unfair, defamatory, infringing, libelous, disparaging, obscene or otherwise objectionable to Google. Never display a Google Translate trademark on any web site or user interface that contains or displays adult content, promotes gambling, promotes violence, contains hate speech, involves the sale of tobacco or alcohol to persons under twenty-one years of age, violates other applicable laws or regulations or is otherwise objectionable. The <company name> website has been translated for your convenience using translation software powered by Google Translate. Reasonable efforts have been made to provide an accurate translation, however, no automated translation is perfect nor is it intended to replace human translators. Translations are provided as a service to users of the <company name> website, and are provided "as is." No warranty of any kind, either expressed or implied, is made as to the accuracy, reliability, or correctness of any translations made from <source language> into any other language. Some content (such as images, videos, Flash, etc.) may not be accurately translated due to the limitations of the translation software. The official text is the <source language> version of the website. Any discrepancies or differences created in the translation are not binding and have no legal effect for compliance or enforcement purposes. If any questions arise related to the accuracy of the information contained in the translated website, please refer to the <source language> version of the website which is the official version. Please note that this example is for illustrative purposes only. We encourage you to consult your legal advisor about any additional disclaimers.